When I came across this recipe I thought it was very interesting. At first it looked like a carbonara sauce but what were the Italian sausage and tomato sauce doing in there? I do not think that you can go wrong by adding Italian sausage to a pasta dish… It was pretty tasty. The meat sauce by itself (before tossing with the egg yolk and cream mixture) is very tasty and could go by itself. It is alway fun to experiment with dishes; adding things, removing things. Brown the sausage and pancetta in a pan. Add the tomato sauce, parsley, salt and pepper to taste. Turn off the heat and mix in the parsley. Mix the egg yolk and cream in a warm bowl. Add the cooked spaghetti and one serving of the meat sauce to the bowl and toss. It’s kind of the love child of Carbonara and Bolognese… I like it! I’m bookmarking it! Good show Kevin…I’m coming over with the wine! Kevin, it does look like an awesome marriage of two great dishes. Thanks for experimenting and for sharing with Presto Pasta Nights. Oh boy! Kevin! You cook wonderful food! you know, this is a blasphemy for any italian?! 1. bolognese sauce, (called ragù) NEVER goes with spaghetti, which are from Naples, but with tagliatelle (different shape, different ingredients). 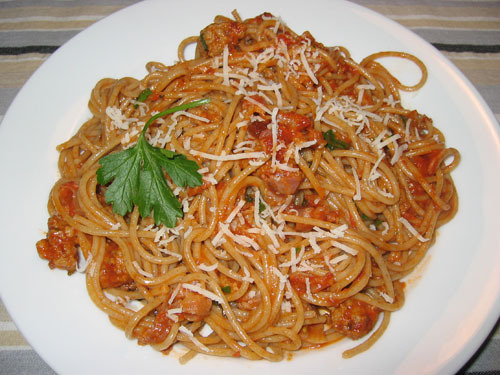 3. your recepit looks rather than a strange version of Amatriciana (the only one where you mix bacon and tomato), but that’s smth different! oh my god… cream in carbonara is an horrible abomination… and jesus… ONION? wtf? Authentic or not, this dish was UNBELIEVABLE! I absolutely loved it! I almost loved it more than the regular, authentic Carbonara I had in Italy. Wow! Thank you! Hey how many people does this recipe serve?? Anonymous: This makes 2 servings.